Aren't there just days when you don't want to cook.... like lots of days. Days when you wish your husband and kids liked leftovers more? Or when you wished you had long since put something in the crock pot? That is where this series idea was born. This is the first of a few - "cook once, eat twice" blogs coming your way. Basically, you will cook the meat and veggies on one day for two meals. Two totally different, nothing close to leftover meals. I mean... yes please!! For me really the only way I know to get a healthy dinner on the table is to keep things super simple. I hope this idea of cooking once, but having two different meals helps you feed your family in a healthy way. I want my kids to have memories in the kitchen, around the table. It really is something I want as the foundation for my kid's memories of our home. Sitting around the kitchen table talking about our day. God can use a home, a table. I have seen this first hand, even with a three and one year old. Honestly, it has become one of the only times without technology. I am so glad I was present for these conversations. We have a table full of kids and food, that is special. Just like I want my kid's memory full of yummy meals over good conversations, these are going to be my memories of their childhood. Whatever that look like for you... you have your "people" to cook for and that is not something to take for granted. Feeds a family of four for two nights. Optional toppings: cilantro, green onion, avocado, and celery. Preheat oven to 400 degrees. Get out a sheet pan and line it with parchment paper. :ay out the chicken breast on one side. Take another piece of parchment paper and lay on top. Tuck the corners and edges under the chicken slightly (making a tent). On the other side put the sweet potatoes, whole tomatillos, and bell peppers cut in half. Drizzle the vegetables with avocado oil. At twenty minutes in the oven pull out the tomatillos and bell peppers. Set aside. At thirty minutes pull out the chicken. Leave the sweet potatoes in while you prepare the chicken. In a stand mixer put half the chicken, tomatillos, garlic, cumin, and lime. Mix, this will cause the chicken to shred. Pack up this chicken with the bell peppers and put into the fridge for later. Put the rest of the chicken in the same stand mixer. Add the mayo and frank sauce. Combine. Get out the sweet potatoes, cut open and stuff with chicken. Top with optional toppings. Literally just warm everything up and serve. Feel free to cook the shredded chicken however you like to. An Instant Pot or Crock Pot would really speed this process up. 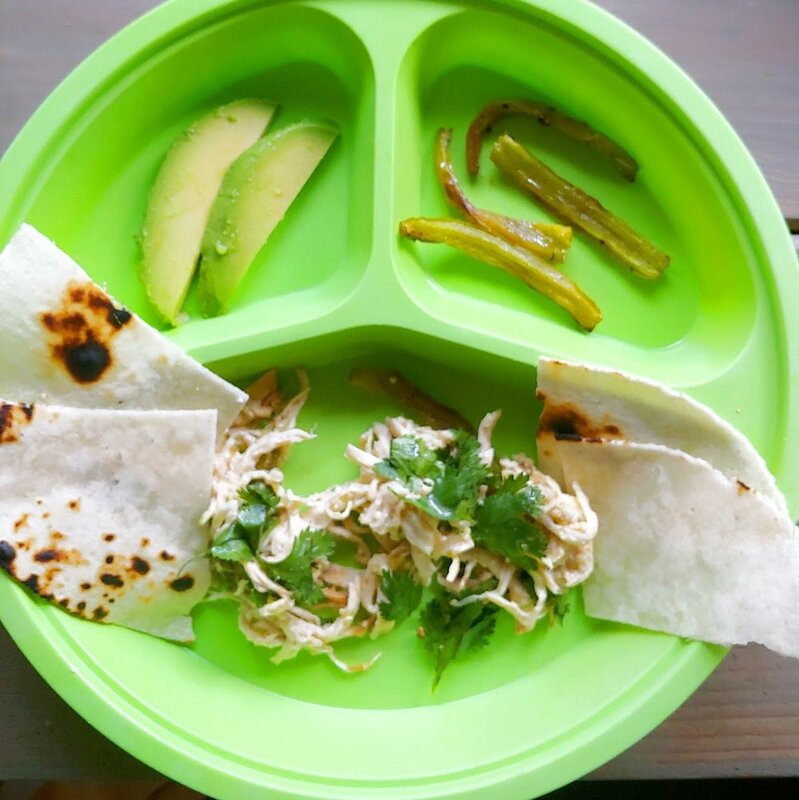 I love these grain free tortillas by Siete. Doing corn tortillas or lettuce wraps is another great way to up the nutrition. My children love both these dinners. The tomatillo isn't spicy and surprisingly the Frank's Red Sauce is mild enough for them. I hope your children enjoy. If you do like spice... throw a jalapeno on the sheet pan and blend up in the tomatillo sauce. You can top the buffalo chicken sweet potato with more sauce.